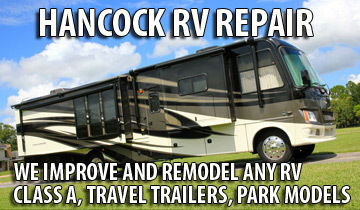 Hancock RV Repair offers full travel trailer restoration. 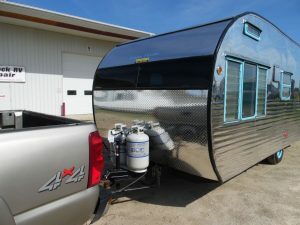 We also offer upgrade options to suit your vintage travel trailer to meet your individual needs. 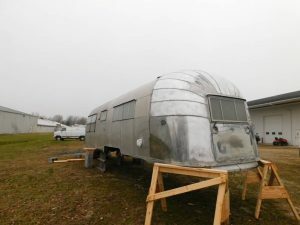 Vintage Travel Trailer Restoration is worthwhile. You simply can’t match the level of quality and style in modern trailers found in vintage models. 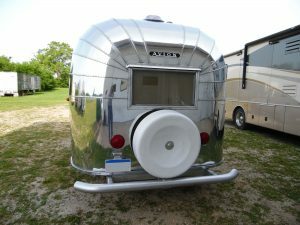 Since 1936, Airstreams have been manufactured. They are a very popular vintage brand which is still around today. 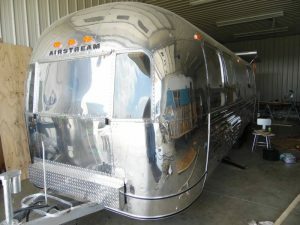 If you are looking to have your vintage airstream restored, give us a call. 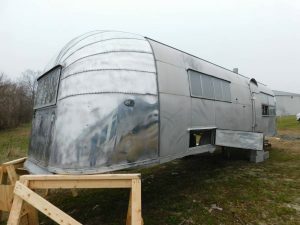 This is a rare 1957 Airstream Sovereign of the Road. It is 30′ long. Less than 100 were made in 57. We are making a new frame, axles, and wheels for it. It is partly polished and we plan to make it into a vending trailer. If you hurry we could do a nice restoration for someone. It will be past the point of restoration soon, so don’t wait. From 1930 through 1957, Airfloat trailers were manufactured. Hancock RV can restore your vintage Airfloat travel trailer back to original, or make custom improvements to the classic design. Aloha travel trailers were originally manufactured from 1954 through 1970. Aloha was a small company. Many of their models were compact. When you need your vintage Aloha Travel Trailer Restoration, look no further than Hancock RV Repair. From 1956 through 1974, Aristocrat travel trailers were manufactured to be low enough to store in a garage. Vintage Aristocrat Travel Trailers are nice restoration projects. Get your Lo-Liner series Vintage Aristocrat travel trailer the restoration job it deserves at Hancock RV Repair. 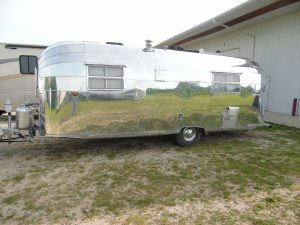 From 1957 through 1963, Avion Travel trailers were built with a mirrored polish aluminum shell. After that date, they were manufactured with a beautiful, and more durable satin shell. 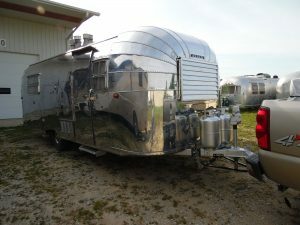 Both iterations of the very nice Vintage Avion Travel Trailers are excellent candidates to be restored by Hancock RV Repair. A restored vintage Avion travel trailer is something that can be handed down to the next generation. From the 1950’s through 1978, Cardinal travel trailer were a basic unit. Cardinals range from 10′ to 17′ and and can be hauled by most passenger vehicles. 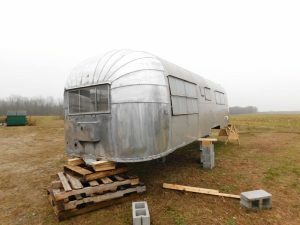 Get you Vintage Cardinal travel trailer restoration started by Hancock RV Repair today. From 1958 to 1979 Forest City Industries, manufactured Forester Travel Trailers. Forester travel trailers have simple lines. They are good for restoration. 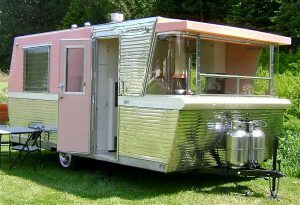 Holiday House travel trailers were designed and built from 1959 to 1962 and are vastly different style from the other “canned ham” travel trailers of the day. These are an excellent choice for restoration, as they are stylish as well as collectible. Kenskill was manufactured from 1946 until 1976. They are tall, with headroom enough to stand in. 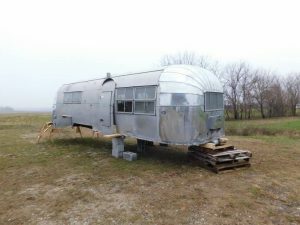 Get your vintage Kenskill travel trailer restored by a professional when you call Hancock RV Repair. Spartan travel trailers, manufactured from 1945 to 1961, are high-end vintage travel trailers. No expense was spared in their design or execution. This is one of the main reasons Spartan Travel Trailers are work getting restored. Shasta is one of the most recognizable brands of vintage travel trailers. They were manufactured from 1941 through 2004. The company again began manufacturing units in 2010. Shasta’s unique wings make it a favorite among vintage travel trailer enthusiasts. Yellow stone models from 1967 through 1990 are a classic choice among vintage travel trailer owners. 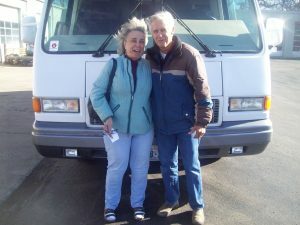 Restoration of vintage Yellowstones in the Camino, Capri, and Country Club series can be done at Hancock RV Repair. In conclusion, no matter the brand of vintage travel trailer you have, Hancock RV Repair has the know-how to restore your unit to its former glory. Call us or email today to get started on path to vacation on the open road.